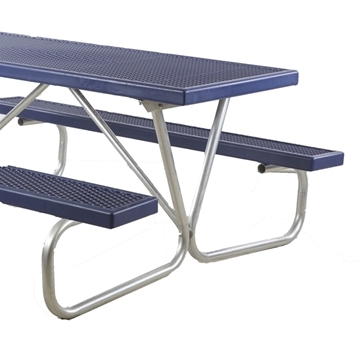 Picnic Furniture features heavy duty picnic table frame kits designed for easy on-site construction of your own picnic table. Just add tops and seats to these highly durable picnic frames and you're complete. Cut back on funds by purchasing your own planks locally with the benefit of choosing your preferred color and material. Frame kits also save on shipping costs as the lack of planks allows for more compact packaging saving on space. Our commercial frame kits are made from rust-resistant galvanized steel that will last years in constant outdoor exposure. If you bought a picnic table from us in the past and looking to replace the frame rather than the entire picnic table, give our friendly staff a call. We will do our best to find your order history to get the right model number for your picnic table to get the correct frames. We offer quantity discounts that can also save on shipping.